The human eye is optimised to have good colour vision at day and high sensitivity at night. But until recently it seemed as if the cells in the retina were wired the wrong way round, with light travelling through a mass of neurons before it reaches the light-detecting rod and cone cells. New research presented at a meeting of the American Physical Society has uncovered a remarkable vision-enhancing function for this puzzling structure. Section through the retina and its layers. About a century ago, the fine structure of the retina was discovered. 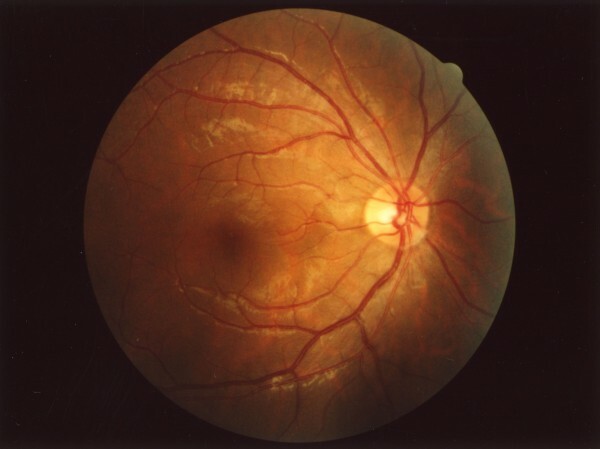 The retina is the light-sensitive part of the eye, lining the inside of the eyeball. The back of the retina contains cones to sense the colours red, green and blue. Spread among the cones are rods, which are much more light-sensitive than cones, but which are colour-blind. 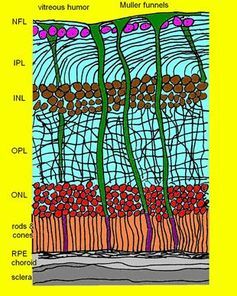 Before arriving at the cones and rods, light must traverse the full thickness of the retina, with its layers of neurons and cell nuclei. These neurons process the image information and transmit it to the brain, but until recently it has not been clear why these cells lie in front of the cones and rods, not behind them. This is a long-standing puzzle, even more so since the same structure, of neurons before light detectors, exists in all vertebrates, showing evolutionary stability. Researchers in Leipzig found that glial cells, which also span the retinal depth and connect to the cones, have an interesting attribute. These cells are essential for metabolism, but they are also denser than other cells in the retina. In the transparent retina, this higher density (and corresponding refractive index) means that glial cells can guide light, just like fibre-optic cables. In view of this, my colleague Amichai Labin and I built a model of the retina, and showed that the directional of glial cells helps increase the clarity of human vision. But we also noticed something rather curious: the colours that best passed through the glial cells were green to red, which the eye needs most for daytime vision. The eye usually receives too much blue – and thus has fewer blue-sensitive cones. Further computer simulations showed that green and red are concentrated five to ten times more by the glial cells, and into their respective cones, than blue light. Instead, excess blue light gets scattered to the surrounding rods. This surprising result of the simulation now needed an experimental proof. 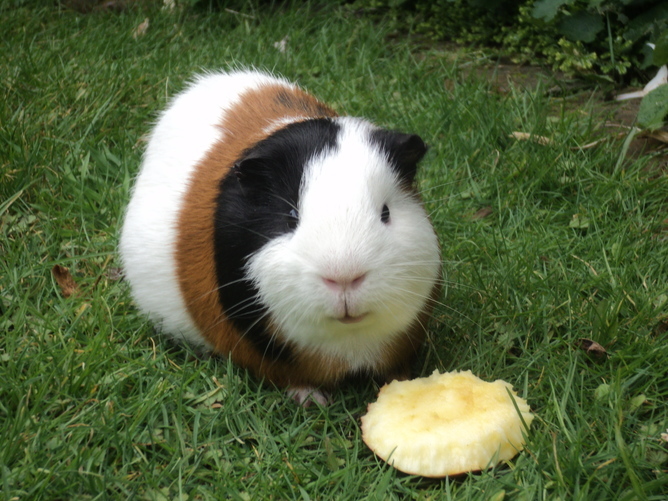 With colleagues at the Technion Medical School, we tested how light crosses guinea pig retinas. Like humans, these animals are active during the day and their retinal structure has been well-characterised, which allowed us to simulate their eyes just as we had done for humans. Then we passed light through their retinas and, at the same time, scanned them with a microscope in three dimensions. This we did for 27 colours in the visible spectrum. The result was easy to notice: in each layer of the retina we saw that the light was not scattered evenly, but concentrated in a few spots. These spots were continued from layer to layer, thus creating elongated columns of light leading from the entrance of the retina down to the cones at the detection layer. Light was concentrated in these columns up to ten times, compared to the average intensity. Even more interesting was the fact that the colours that were best guided by the glial cells matched nicely with the colours of the cones. The cones are not as sensitive as the rods, so this additional light allowed them to function better – even under lower light levels. Meanwhile, the bluer light, that was not well-captured in the glial cells, was scattered onto the rods in its vicinity. These results mean that the retina of the eye has been optimised so that the sizes and densities of glial cells match the colours to which the eye is sensitive (which is in itself an optimisation process suited to our needs). This optimisation is such that colour vision during the day is enhanced, while night-time vision suffers very little. The effect also works best when the pupils are contracted at high illumination, further adding to the clarity of our colour vision.